This LO has a photo of my son Ethan (who has just headed off to uni) in this photo he was strolling down the street with his wee cousin Fee. She was telling me the other day how much she misses him and asking when he was coming home. I have use the 2011/13 Patterns Designer Series Paper Stack – I really love these colors. There are more Doodling features again on this LO, I used the Stampin’ Write Journaler on all the paper pieces and lots of black ink sponged on the edges of everything. The Tasteful Trim die is another of my absolute favorites for scrapbooking, add some circles, the Heart to Heart punch and some brads from the SAB Everyday Enchantment Ribbon & Brad pack then pop a few hearts up with some dimensionals – Done! This not one of my favorite LOs but the photos were ones I just had to scrap. The photos were taken on my son Ethan’s birthday – we had gone out for a family tea. 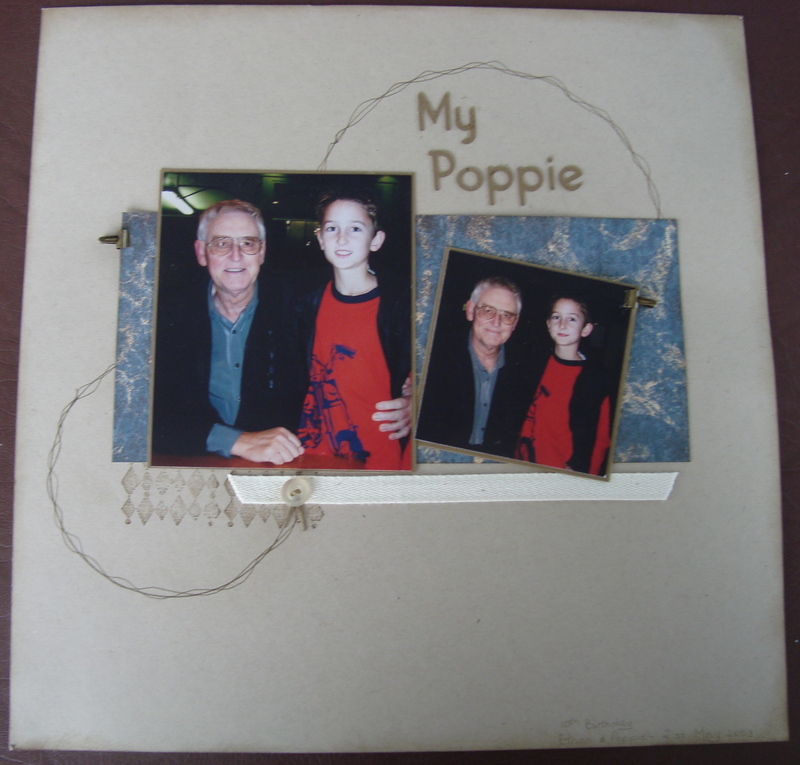 My Dad – Poppie, passed away 6 days later, so these are the last photos Ethan has with his Poppie. I wanted the LO to be simple and all about the snap shots. I doodled the circles, stamped with Grunge Rock, added some twill tape, a button and mini library clips, finished off with sponging on all edges. Sometimes these types of photos never really feel like they fit the LO as they have so much emotion attached to them, I think for me simple is best. I really like to scrap single photo layouts, many people feel that this is a waste of a “whole page” but I beg to differ as we never get the moment captured in the photo back again so why not celebrate that special snapshot. This photo is one of those moments. There is lots of white space in this LO and the photo is purposely cropped small to eliminate the background so the whole focus is on this cute wee girl. Cheerful Treat DSP has so many lovely colors to work with so I just used some of them in the elements of the LO, a stamp from the Word Play set, the Decorative Label Punch, Scallop Trim Border, Blossom Party Die and Scallop Circle Bigz Die. The stamp set Notes & Details is one of my favorites for scrapping, I used the date stamp for this LO. Sometimes I like to go thru my “stash” of paper and use some scraps that have been around for awhile. 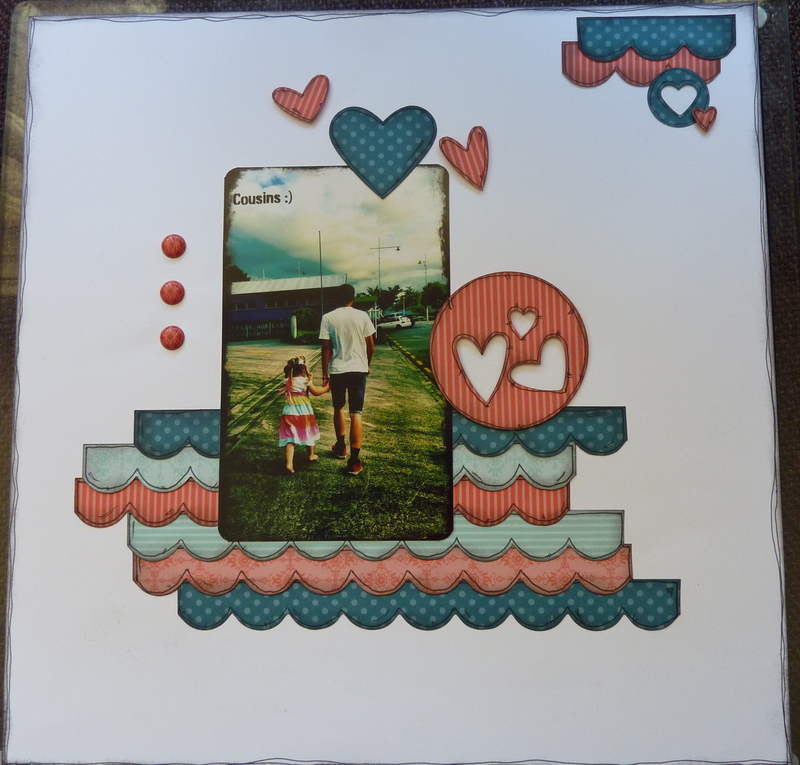 This LO uses the Play date DSP which was one of my favs from the old Stampin’ Up catalogue. This LO is a take on the color blocking concept but also uses “white space”. I love the little owl – so easy to make with the Owl Punch. Making your own embellishments means they are always co-ordinated with your LO. Rounding the corners of your papers, photos and mats is a great way to “soften” the look of your page. Finished off with some rub ons from the “stash” and there you have it an easy peasy page – done in a flash. I’ve just got the laptop back from the repair shop – so finally I can post to the blog again. This LO has lots of white space, which I love. I have used the Color Spritzer Tool to splatter the background – another of my favorite things to do. Just Add Cake and Cheerful Treat DSP compliment the colors in the photo. The photo is closely cropped – usually I would re-print the photo to make it 6×4, but decided to make a feature of the small size. The Tasteful Trim die does a great job of cutting the rickrack and the Petite Pennants Builder punch makes perfect pennants every time. Finished off with handwriting for part of the title and some bitty buttons.